Well! It was just twenty years ago, and within a day or two of the end of the grouse season. I had been out all day with my gun, and had had no sport to speak of. The wind was due east; the month, December; the place, a bleak wide moor in the far north of England. And I had lost my way. It was not a pleasant place in which to lose one's way, with the first feathery flakes of a coming snowstorm just fluttering down upon the heather, and the leaden evening closing in all around. I shaded my eyes with my hand, and staled anxiously into the gathering darkness, where the purple moorland melted into a range of low hills, some ten or twelve miles distant. Not the faintest smoke-wreath, not the tiniest cultivated patch, or fence, or sheep-track, met my eyes in any direction. There was nothing for it but to walk on, and take my chance of finding what shelter I could, by the way. So I shouldered my gun again, and pushed wearily forward; for I had been on foot since an hour after daybreak, and had eaten nothing since breakfast. Even now, weary as I was, I felt that with a supper, an hour's rest, and a guide, I might still get back to her before midnight, if only guide and shelter could be found. "Thank God!" was the exclamation that burst involuntarily from my lips. "What for?" growled he, sulkily. "Well--for you. I began to fear I should be lost in the snow." "Eh, then, folks do get cast away hereabouts fra' time to time, an' what's to hinder you from bein' cast away likewise, if the Lord's so minded?" "If the Lord is so minded that you and I shall be lost together, friend, we must submit," I replied; "but I don't mean to be lost without you. How far am I now from Dwolding?" "A gude twenty mile, more or less." "The nearest village is Wyke, an' that's twelve mile t'other side." "Where do you live, then?" "Out yonder," said he, with a vague jerk of the lantern. "You're going home, I presume?" "It ain't o' no use," growled he. "He 'ont let you in--not he." "We'll see about that," I replied, briskly. "Who is He?" "That's nowt to you," was the unceremonious reply. "Well, well; you lead the way, and I'll engage that the master shall give me shelter and a supper to-night." "Eh, you can try him!" muttered my reluctant guide; and, still shaking his head, he hobbled, gnome-like, away through the falling snow. A large mass loomed up presently out of the darkness, and a huge dog rushed out, barking furiously. "Is this the house?" I asked. "Ay, it's the house. Down, Bey!" And he fumbled in his pocket for the key. Once inside, I looked round with curiosity, and found myself in a great raftered hall, which served, apparently, a variety of uses. One end was piled to the roof with corn, like a barn. The other was stored with flour-sacks, agricultural implements, casks, and all kinds of miscellaneous lumber; while from the beams overhead hung rows of hams, flitches, and bunches of dried herbs for winter use. In the centre of the floor stood some huge object gauntly dressed in a dingy wrapping- cloth, and reaching half way to the rafters. Lifting a corner of this cloth, I saw, to my surprise, a telescope of very considerable size, mounted on a rude movable platform, with four small wheels. The tube was made of painted wood, bound round with bands of metal rudely fashioned; the speculum, so far as I could estimate its size in the dim light, measured at least fifteen inches in diameter. While I was yet examining the instrument, and asking myself whether it was not the work of some self-taught optician, a bell rang sharply. "That's for you," said my guide, with a malicious grin. "Yonder's his room." "Who are you?" said he. "How came you here? What do you want?" "James Murray, barrister-at-law. On foot across the moor. Meat, drink, and sleep." "Mine is not a house of entertainment," he said, haughtily. "Jacob, how dared you admit this stranger?" "I didn't admit him," grumbled the old man. "He followed me over the muir, and shouldered his way in before me. I'm no match for six foot two." "And pray, sir, by what right have you forced an entrance into my house?" "The same by which I should have clung to your boat, if I were drowning. The right of self-preservation." "There's an inch of snow on the ground already," I replied, briefly; "and it would be deep enough to cover my body before daybreak." "It is true," he said. "You can stay, if you choose, till morning. Jacob, serve the supper." I placed my gun in a corner, drew a chair to the hearth, and examined my quarters at leisure. Smaller and less incongruous in its arrangements than the hall, this room contained, nevertheless, much to awaken my curiosity. The floor was carpetless. The whitewashed walls were in parts scrawled over with strange diagrams, and in others covered with shelves crowded with philosophical instruments, the uses of many of which were unknown to me. On one side of the fireplace, stood a bookcase filled with dingy folios; on the other, a small organ, fantastically decorated with painted carvings of mediæval saints and devils. Through the half-opened door of a cupboard at the further end of the room, I saw a long array of geological specimens, surgical preparations, crucibles, retorts, and jars of chemicals; while on the mantelshelf beside me, amid a number of small objects, stood a model of the solar system, a small galvanic battery, and a microscope. Every chair had its burden. Every corner was heaped high with books. The very floor was littered over with maps, casts, papers, tracings, and learned lumber of all conceivable kinds. "I have but the homeliest farmhouse fare to offer you, sir," said my entertainer. "Your appetite, I trust, will make up for the deficiencies of our larder." "Sir, I have lived here in strict retirement for three-and-twenty years. During that time, I have not seen as many strange faces, and I have not read a single newspaper. You are the first stranger who has crossed my threshold for more than four years. Will you favour me with a few words of information respecting that outer world from which I have parted company so long?" "Pray interrogate me," I replied. "I am heartily at your service." His inquiries related chiefly to scientific matters, with the later progress of which, as applied to the practical purposes of life, he was almost wholly unacquainted. No student of science myself, I replied as well as my slight information permitted; but the task was far from easy, and I was much relieved when, passing from interrogation to discussion, he began pouring forth his own conclusions upon the facts which I had been attempting to place before him. He talked, and I listened spellbound. He talked till I believe he almost forgot my presence, and only thought aloud. I had never heard anything like it then; I have never heard anything like it since. Familiar with all systems of all philosophies, subtle in analysis, bold in generalisation, he poured forth his thoughts in an uninterrupted stream, and, still leaning forward in the same moody attitude with his eyes fixed upon the fire, wandered from topic to topic, from speculation to speculation, like an inspired dreamer. From practical science to mental philosophy; from electricity in the wire to electricity in the nerve; from Watts to Mesmer, from Mesmer to Reichenbach, from Reichenbach to Swedenborg, Spinoza, Condillac, Descartes, Berkeley, Aristotle, Plato, and the Magi and mystics of the East, were transitions which, however bewildering in their variety and scope, seemed easy and harmonious upon his lips as sequences in music. By-and-by--I forget now by what link of conjecture or illustration--he passed on to that field which lies beyond the boundary line of even conjectural philosophy, and reaches no man knows whither. He spoke of the soul and its aspirations; of the spirit and its powers; of second sight; of prophecy; of those phenomena which, under the names of ghosts, spectres, and supernatural appearances, have been denied by the sceptics and attested by the credulous, of all ages. "The world," he said, "grows hourly more and more sceptical of all that lies beyond its own narrow radius; and our men of science foster the fatal tendency. They condemn as fable all that resists experiment. They reject as false all that cannot be brought to the test of the laboratory or the dissecting-room. Against what superstition have they waged so long and obstinate a war, as against the belief in apparitions? And yet what superstition has maintained its hold upon the minds of men so long and so firmly? Show me any fact in physics, in history, in archæology, which is supported by testimony so wide and so various. Attested by all races of men, in all ages, and in all climates, by the soberest sages of antiquity, by the rudest savage of to-day, by the Christian, the Pagan, the Pantheist, the Materialist, this phenomenon is treated as a nursery tale by the philosophers of our century. Circumstantial evidence weighs with them as a feather in the balance. The comparison of causes with effects, however valuable in physical science, is put aside as worthless and unreliable. The evidence of competent witnesses, however conclusive in a court of justice, counts for nothing. He who pauses before he pronounces, is condemned as a trifler. He who believes, is a dreamer or a fool." He spoke with bitterness, and, having said thus, relapsed for some minutes into silence. Presently he raised his head from his hands, and added, with an altered voice and manner, "I, sir, paused, investigated, believed, and was not ashamed to state my convictions to the world. I, too, was branded as a visionary, held up to ridicule by my contemporaries, and hooted from that field of science in which I had laboured with honour during all the best years of my life. These things happened just three-and-twenty years ago. Since then, I have lived as you see me living now, and the world has forgotten me, as I have forgot--ten the world. You have my history." "It is a very sad one," I murmured, scarcely knowing what to answer. "It is a very common one," he replied. "I have only suffered for the truth, as many a better and wiser man has suffered before me." "It has ceased snowing," he observed, as he dropped the curtain, and came back to the fireside. "Ceased!" I exclaimed, starting eagerly to my feet. "Oh, if it were only possible--but no! it is hopeless. Even if I could find my way across the moor, I could not walk twenty miles to-night." "Walk twenty miles to-night!" repeated my host. "What are you thinking of?" "Of my wife," I replied, impatiently. "Of my young wife, who does not know that I have lost my way, and who is at this moment breaking her heart with suspense and terror." "At Dwolding, twenty miles away." "At Dwolding," he echoed, thoughtfully. "Yes, the distance, it is true, is twenty miles; but--are you so very anxious to save the next six or eight hours?" "So very, very anxious, that I would give ten guineas at this moment for a guide and a horse." "Your wish can be gratified at a less costly rate," said he, smiling. "The night mail from the north, which changes horses at Dwolding, passes within five miles of this spot, and will be due at a certain cross-road in about an hour and a quarter. If Jacob were to go with you across the moor, and put you into the old coach-road, you could find your way, I suppose, to where it joins the new one?" "The snow lies deep, and it will be difficult walking to-night on the moor. A glass of usquebaugh before you start?" "It is strong," he said; "but it will help to keep out the cold. And now you have no moments to spare. Good night!" "Yon's your road. Keep the stone fence to your right hand, and you can't fail of the way." "This, then, is the old coach-road?" "Ay, 'tis the old coach-road." "And how far do I go, before I reach the cross-roads?" "The road's a fair road enough," said he, "for foot passengers; but 'twas over steep and narrow for the northern traffic. You'll mind where the parapet's broken away, close again the sign-post. It's never been mended since the accident." "Eh, the night mail pitched right over into the valley below--a gude fifty feet an' more--just at the worst bit o' road in the whole county." "Horrible! Were many lives lost?" "All. Four were found dead, and t'other two died next morning." "How long is it since this happened?" "Near the sign-post, you say? I will bear it in mind. Good night." "Gude night, sir, and thankee." Jacob pocketed his half-crown, made a faint pretence of touching his hat, and trudged back by the way he had come. Meanwhile the night air seemed to become colder and colder, and though I walked fast I found it impossible to keep myself warm. My feet were like ice. I lost sensation in my hands, and grasped my gun mechanically. I even breathed with difficulty, as though, instead of traversing a quiet north country highway, I were scaling the uppermost heights of some gigantic Alp. This last symptom became presently so distressing, that I was forced to stop for a few minutes, and lean against the stone fence. As I did so, I chanced to look back up the road, and there, to my infinite relief, I saw a distant point of light, like the gleam of an approaching lantern. I at first concluded that Jacob had retraced his steps and followed me; but even as the conjecture presented itself, a second light flashed into sight--a light evidently parallel with the first, and approaching at the same rate of motion. 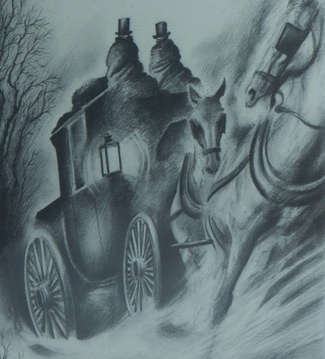 It needed no second thought to show me that these must be the carriage-lamps of some private vehicle, though it seemed strange that any private vehicle should take a road professedly disused and dangerous. "How intensely cold it is to-night," I said, addressing my opposite neighbour. "The winter," I added, "seems to have begun in earnest." "This coach," I said, "is in a deplorable condition. The regular mail, I suppose, is under repair?" The words that I was about to utter died upon my lips, and a strange horror--a dreadful horror--came upon me. My sight had by this time become used to the gloom of the coach, and I could see with tolerable distinctness. I turned to my opposite neighbour. He, too, was looking at me, with the same startling pallor in his face, and the same stony glitter in his eyes. I passed my hand across my brow. I turned to the passenger on the seat beside my own, and saw--oh Heaven! how shall I describe what I saw? I saw that he was no living man--that none of them were living men, like myself! A pale phosphorescent light--the light of putrefaction--played upon their awful faces; upon their hair, dank with the dews of the grave; upon their clothes, earth-stained and dropping to pieces; upon their hands, which were as the hands of corpses long buried. Only their eyes, their terrible eyes, were living; and those eyes were all turned menacingly upon me! In that single instant, brief and vivid as a landscape beheld in the flash of summer lightning, I saw the moon shining down through a rift of stormy cloud--the ghastly sign-post rearing its warning finger by the wayside--the broken parapet--the plunging horses--the black gulf below. Then, the coach reeled like a ship at sea. Then, came a mighty crash--a sense of crushing pain--and then, darkness. I never told my wife the fearful events which I have just related to you. I told the surgeon who attended me; but he treated the whole adventure as a mere dream born of the fever in my brain. We discussed the question over and over again, until we found that we could discuss it with temper no longer, and then we dropped it. Others may form what conclusions they please--I know that twenty years ago I was the fourth inside passenger in that Phantom Coach. Add The Phantom Coach to your own personal library.